This example involves adding integers which is a major challenge for many students. There are two strategies present in the photo. Color coding is an effective way to break down a concept into parts. 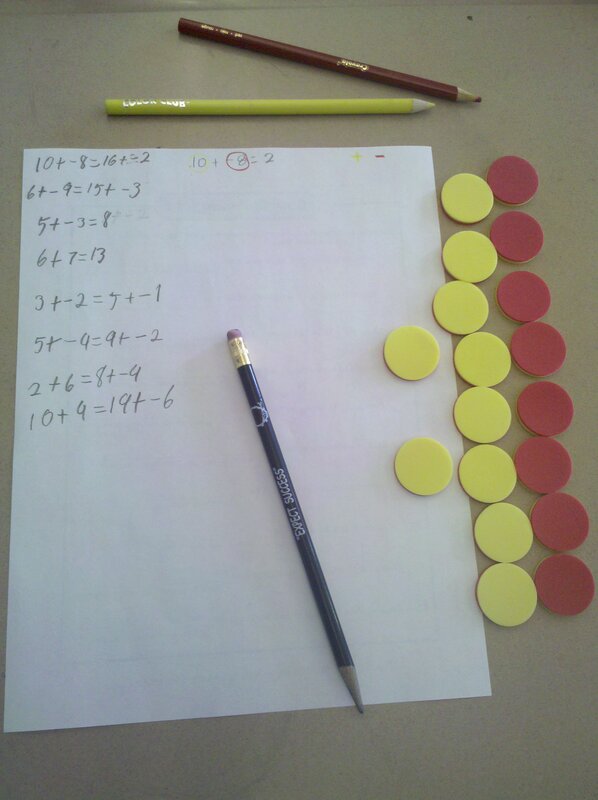 Here red is used for negative numbers and yellow for positive. The numbers are written in red and yellow with colored pencils. The chips are a concrete representation. Typically integers are only presented in number form and often with a rule similar to the one below. The strategy is to count out the appropriate number of red chips for the negative number and yellow chips for positive number. Each yellow chip cancels a red chip and what remains is the final answer. If there are two negative numbers then there is no canceling and the total number of red chips is computed (same with positive and yellow). Rules are easy to forget or mix up especially when students learn the rules for multiplying integers. Concrete allows students to internalize the concept as opposed to memorize some abstract rule in isolation.